A stainless steel measuring cup with stamped or laser-etched notches and no ink/markings to come off. That was all I wanted. I did not want a glass measuring cup that would leave behind a hundred surprises in an accident. And a soft plastic measuring cup with all the red markings faded pushed me to want a stainless steel option in the first place. Well, I didn't find the large stainless steel cup I wanted. The next best thing was a set of large stainless steel spoons -- they were called "cups" but they were more like big spoons to me. Found these Amco (model 8440) measuring cups on the Amazon.ca site. From what I could gather, they were supposedly stainless steel, made from a single piece of material, and had stamped markings. The reviews were also to my liking. At about CA$ 20, these Amco measuring cups appeared adequate for my uses and an acceptable compromise at a reasonable price. Wasn't in the mood to take any pictures when the package arrived. I think I recall the cups coming in a clear plastic bag. Inside were four cups and a steel ring. Everything was washed in the sink with soap and left to dry for a week -- not because it took so long to dry but because I didn't need them yet. Nothing exciting which is exactly how I like it. They appeared to be of reasonable quality on the surface. The stamped letters and numbers looked clear. 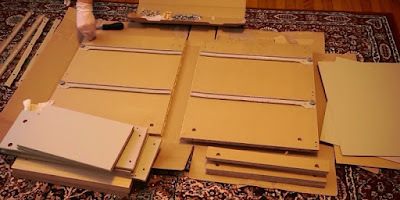 I didn't notice any problems with the steel such as rust or discoloration. I've so far used them to bake a cake -- more accurately, to use up some cake mix that was two months past the best before date. Think the 1/3 cup was the one I used to measure out some cooking oil. 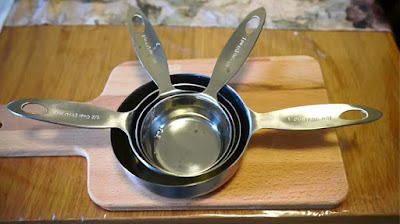 Funny/stupid story: I couldn't find my new Amco measuring cups because they were buried under a set of other utensils. This led me to use the old, crappy plastic measuring cup with faded numbers. They were so faded that the 1/2 line looked like the 1/3 line to me. I poured the 1/2 cup of oil into the Amco 1/3 cup but didn't want to dump the rest and ended up using it to oil the pan. Long story short, there was a lot of extra oil floating around in the cake which is probably why one side decided to rise half an inch more than the other. How did the cup do? It didn't appear to leak and I thought it handled okay. The weight was on the heavier side. Honestly, this single experiment didn't tell me much at all -- I was hoping for a cake that didn't come out deformed and it ended up so because of the extra oil. I decided to see how accurate the cups were by buying a new small glass measuring cup. The assumption was that the glass cup would be accurate. 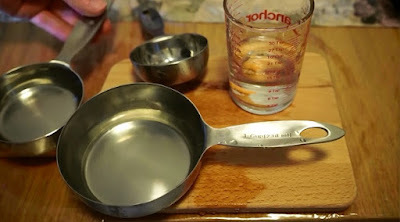 I tested the 1/4, 1/2, and 1 cup Amco measuring cups using water. The glass cup only had markings for 1/4 and 1/2 cup. It looked like my set of 1/4 and 1/2 cups were accurate using this method. To test the steel 1 cup Amco, the 1/4 and 1/2 cups were filled along with the glass cup to the 1/4 cup point. These three cups were poured into the 1 cup, and it worked properly. The half-way points on the 1/2 cup and 1 cup Amcos also appeared to be accurate. You can see a shortened version of this test in the video linked above. One thing that didn't impress me was the ring included with the package. It kept popping open on its own when I lightly handled it. I wouldn't trust it to hold the cups together. The good thing was that I never planned to use the ring. As far as I could tell, the Amco Advanced Performance Measuring Cups worked. No major complaints aside from the ring that was included. As long as they hold up over time, I should be pretty happy.